If the name Donna Maria sounds oddly familiar it might be because she has been all over television and media from ABC to the Wall Street Journal. Maybe you have followed her journey of helping and empowering others all over the world as they build businesses while maintaining life balance through the Indie Business Network. However she has entered your life, one thing is probably true, your life is the better for it! I am often asked, "How did you do that?" or "Where is that location?" when it comes to some of my portrait photography. While I love shooting in different locations and with different tools, I have learned that the most important aspect of an image is the perspective of the creator in relation to that of the viewer. Sometimes we capture an image that does not match our vision, so we edit the image in post. It is often easier though, to express your vision in the camera as much as possible. This is why I set out to create a class, a workshop, geared to photographers of different levels, on how to best capture their own unique vision when time, resources, and equipment are lacking. A learning experience in the why's of creation as well as the "how to's." For the traveling photographer, or client, who may not have the ideal locations available, or $10,000 worth of high-end remote lighting, I feel this workshop will best help them see and express their own unique visions. Would you believe the shot below can be shot in a corner on a plain white wall and less than $500 worth of lighting equipment? A quick shot of subject using a three light setup. While just a simple shot, as shown below, this was a simple three light setup using a strobe head, two basic speak lights, gelled, and whatever stands or items I could find laying around. As an artist that is in business, the two things you have to be able to do is to be able to create content, but more importantly, CONSISTENTLY create content. This September I will be traveling to Kingston, Jamaica to offer one of my coolest training sessions to date. What I love about the concept of this workshop is that it is geared towards photographers who have minimal equipment. It focuses on the creative's concept and the team that you will use as a photographer to help this concept come to life. I feel my teaching style is a little different compared to the other workshops that I have attended. The core of my philosophy is that I do not want my attendees to shoot like me, or copy me. I want them to shoot like themselves, but better. I feel that clients hire photographers primarily on the photographer's own unique style, and the more that photographer's style is refined, the harder it is to duplicate. Similar to a singer and the differences between them even if singing the same song. Being that this workshop is in Jamaica, the objective is to use gear that is readily accessible to most of the photographers there. 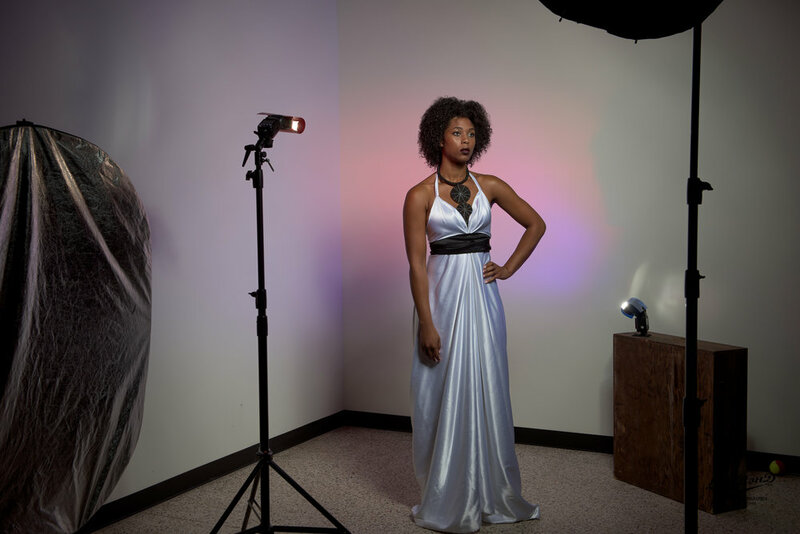 The lighting used for these sessions were used by sub $100 Flashpoint speedlights, with a battery operated strobe set to slave, with $200 modifier. For the workshop though, I will be shooting primarily with 4 flashpoint speedlights and the remote R2 PRO trigger. The images in this post are not retouched and have only been adjusted for exposure by one stop to present well on the screen. No other adjustments have been made. Suppose you have a client who wants to do a boudoir shoot, but you don't have access to a fancy hotel or grand bedroom? As from the image below, you can create something beautiful in front of something as simple as a closet, or even an industrial wall. The focus is on the subject of the image, and creating the mood to showcase the essence of the visual message. My team today was the lovely model Janiece; Tracie Potillo, Makeup Artist; and I was assisted by fellow photographer, Geno Porter. Total session time was about 4 hours from start to finish, which proves to be the perfect time for two different concepts including changes. I always recommend setting asside 60 minutes per look for a clean makeup look so that the MUA/Hair stylist is not rushed during preparation. The workshop is a two day event from September 1 through September 2 in Kingston Jamaica. Photographers are asked to bring primary camera body, primary 3 lenses used, and a notebook to take notes. Lighting, triggers, models, makeup, body painter, wardrobe, and other services will be provided by the workshop. Due to the intimate and hands on nature of the workshop, total seats are limited to 5 photographers. There is an Early Bird discount (Save 35%) for photographers who register by August 3rd.